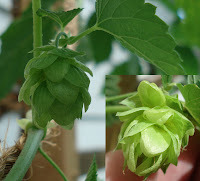 Some of the first few burrs on the Cascade have developed into what looks like actual hop cones! I hadn't noticed them until a few days ago as they were hidden under the leaves. If you look at the closeup, you can even seen the lupulin, the fine yellow resinous powder which is responsible for the flavour and aroma characteristics. There's about half a dozen cones so far but a lot more burrs are still forming. The Nugget doesn't have anything that resembles a cone yet, but there are a lot of sidearms and burrs still growing and developing as well. Its interesting that the sidearms on the Cascade plant have just one burr per arm whereas the sidearms on the Nugget appear to grow clusters of burrs. The real challenge will be keeping these guys alive during the next few weeks. The forecasted highs for later this week is 103F and there's still no chance of rain. My Jalapeno plant is loving this weather but I don't think the hop plants are going to be too happy about it. I manually watered both pots on Saturday until I saw water running out of the holes on the bottom and set the drip irrigation to run for 30 mins every morning. This should provide adequate water, but I'm worried the heat and sun (even though its only morning sunlight) will damage the plants.